In this section, we are going to study about different relationships between pairs of angles. Two angles are vertical angles, if their sides form two pairs of opposite rays. Two adjacent angles are a linear pair, if their non-common sides are opposite rays. m∠5 and m∠6 are a linear pair. Look at the picture shown below and answer the following questions. (i) Are m∠2 and m∠3 a linear pair ? (ii) Are m∠3 and m∠4 a linear pair ? (iii) Are m∠1 and m∠3 vertical angles ? (iv) Are m∠2 and m∠4 vertical angles ? No. The angles are adjacent but their non-common sides are not opposite rays. Yes. The angles are adjacent and their non-common sides are opposite rays. No. The sides of the angles do not form two pairs of opposite rays. 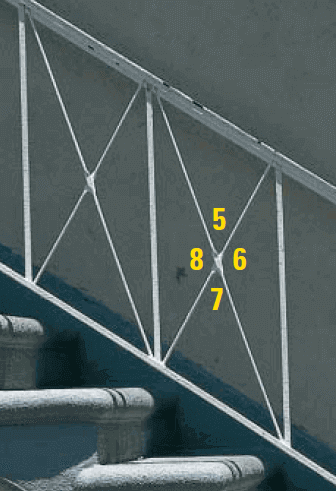 In the stair railing shown at the right, m∠6 has a measure of 130°. Find the measures of the other three angles. m∠6 and m∠7 are a linear pair. So, the sum of their measures is 180°. Subtract 130° from both sides. m∠6 and m∠5 are also a linear pair. So, it follows that m∠7 = 50°. m∠6 and m∠8 are vertical angles. So, they are congruent and they have same measure. In the diagram shown below, Solve for "x" and "y". Then, find the angle measures. Use the fact that the sum of the measures of angles that form a linear pair is 180°. m∠AED and m∠DEB are a linear pair. So, the sum of their measures is 180°. Substitute m∠AED = (3x+5)° and m∠DEB = (x+15)°. Subtract 20 from both sides. m∠AEC and m∠CEB are a linear pair. So, the sum of their measures is 180°. Substitute m∠AEC = (y+20)° and m∠CEB = (4y-15)°. So, the angle measures are 125°, 55°, 55°, and 125°. Because the vertical angles are congruent, the result is reasonable. After having gone through the stuff given above, we hope that the students would have understood "Angle pair relationships".